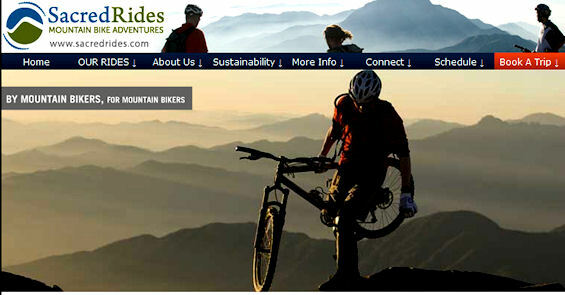 Sacred Rides has been the undisputed leader in Mountain Biking Trips Worldwide for over 13 years, and are the singletrack specialists and the #1 mountain bike adventure company in North America. At Sacred Rides Mountain Bike Adventures, we strive to make every ride sacred. We are the world’s #1 mountain bike tour operator, and we bring passion and inspiration to every trip and every ride. We’ll take you to incredible places around the world, surround you with jaw-dropping scenery, give you amazing cultural experiences, and take you on the world’s most incredible mountain bike trails – all guided by the industry’s strongest environmental and social responsibility mandate. For over 13 years, we have offered award-winning small-group adventures and skills camps around the world, backed by our SATISFACTION GUARANTEE! What sets Sacred Rides Apart? Sustainable Tourism: They have one of the most comprehensive social and environmental responsibility mandates in the business. Experience: With over 13 years of experience leading mountain bike trips around the world, they have the experience and knowhow to deliver you the mountain bike adventure of a lifetime! Local Knowledge: All of their trips are led by friendly locals with a passion for mountain biking and a love of the outdoors. Their Guarantee: They are the only company in the mountain bike tourism industry that will back your trip with a comprehensive guarantee.